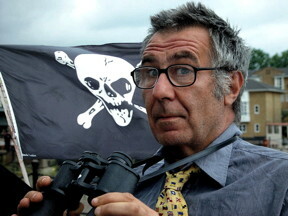 UK comedy legend Malcolm Hardee – Irresponsible, thoughtless or malicious? When I was one day old my dad bought me a train set. But I didn’t see it until I was almost two years old. It was a steam train and ran on methylated spirits held in a little container underneath the engine. It was bigger than your normal train set with a big circular track. What you did was set light to the methylated spirits and this started the piston. My dad set it up in the hall. When I first saw the train, he wouldn’t let me play with it. You know what fathers are like. He set it off and it went so fast centrifugal force took the train off the rails and the burning meths set light to the carpet. Nearly burnt the whole house down. A lot of people have said I came off the rails myself later on and my mother wonders if this incident may also account for my early interest in setting fire to things. Yesterday, I was talking to my friend Louise about Malcolm. “The way his mother told me,” Louise said, “I’m not sure he actually went into an orphanage. His mother told me his granny brought him up while she was in the TB hospital and, when she came out of hospital and was re-united with him, he was cold to her – his mother. That sounds kinda crucial. The mother figure left him and a small kid will transfer his affections to another person and a lot of mothers can be quite angry with a child who does that, even if they try not to show it. You’re talking about a toddler and that confusion between two people… when you’ve gone and attached yourself emotionally to one and they’re whisked off… It’s the very foundation subconsciously. I wonder if that was why he was damaged. You’re always telling me that a lot of the best comedians are damaged. “With Malcolm, it could have been an anger at the world, you know, because of the mother that left, the one that came back and was maybe a bit annoyed he was attached to the grandmother. Whatever. There would be an anger in that little kid. Sitting back watching if a car catches fire or if someone trips over and falls. “Why did you not mind that?” asked Louise. “And Malcolm did enjoy bad taste,” I said.